Hi everyone, I know I am just a tad late talking about this topic but my "intentions" are in the right direction. Pardon the pun! Lets talk Sewing and Quilting Resolutions. What do you think? Is sewing and quilting an important part of your life? Does it fulfill you at times when nothing else does? Is your sewing room your happy place? If you answered yes to any or all of these questions then resolutions would be a great way to keep your sewing creative, exciting and maintain your happiness! I know resolutions or "intentions" really help me personally to get focused for the coming year. They give me a direction to start and make some progress over the coming year. At the end of the year it is also a good way to reflect on what you have accomplished! 1) Make Do! and this means to try not to purchase any more stuff unless I absolutely need it!. My grandma used to use the phrase "make do and mend" and this really applied to household goods and clothing. But sincerely, I have accumulated so much quilting, sewing and crafting supplies over the years that I can literally keep myself busy for many years to come and I "need" nothing at the present time. This does not mean I will not keep up with current fabric trends. I just need a pause button on the having to have the latest and most beautiful fabrics! I am hoping to share with you some tried, true and tested tools and supplies that I love and work with currently over the course of 2017. 2) Learn.... EQ 7. I accomplished some learning in 2016 and used it for my Quilt Featured Summer 2016 issue #28 of Quilters' Connection Magazine. 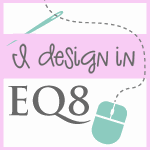 ​In 2017 I want to learn more and become even better at designing with EQ 7 It is so much fun and an effective tool to design with. I am hoping to share my learning with you in the coming year! 3) Reduce, Reuse and Recycle. I know we have all heard a lot of this before and in fact the City of Waterloo is changing its garbage service this year in an effort to force folks to reduce their waste. ​By noting it as an intention it is to make myself accountable by reducing some of my consumables. I also plan to show my blog followers some neat projects they can do to reduce waste, recycle goods and reuse some common household items! ​I really do dance in my studio!! Not a guilty pleasure at all! I get up every 20 minutes to save my back and move! Please dont go there with the visual!! I also plan to continue to enjoy showing my blog followers what I am working on. If I am not enthusiastic, you don't feel inspired either! 5) Think outside of the box. I plan to continue to create and share innovative, useful and classy projects that you as a blog follower will want to make. Nothing is worse than making something and not being excited about it! So I am going to try to focus on projects that show interesting construction, beautiful form and excellent function. 6) Use up my stash! Oh happy day! This means I can buy more fabric next year!! I just need to pause and focus on projects that use of my stash of beautiful fabric and show you how to also use up your stash! ​Yes you can buy more fabric next year too! If your stash is not that big, you can buy more next month after you try some of the upcoming projects on this blog! This sounds like a fantastic intention when you put it this way! 7) Last but not least Complete Quality Work! This includes completing some UFO's, doing some wonderful custom longarming for my customers and being mindful about producing great quality patterns and projects for you as our blog followers. I will of course share my work on a weekly basis so check back often, I am hoping we can inspire you! Follow along with us as we try to follow these intentions, I am sure this 2017 journey will be fun and informative! A very Happy New Year to you too! I am looking forward to using up my stash with you & you definitely do inspire me. Looking forward to your 2017 Blog. PS.....I play my music loud in my studio too & it is definitely "my happy place" without question! Thanks Mabsy! Great minds think alike! Lol Thanks for being such a great and positive cheerleader of my work!